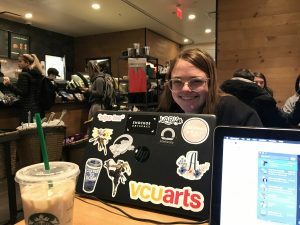 There is a strong connection between college students and coffee. Coffee shops on campuses, specifically Starbucks, seem to be liminal spaces in the world of higher education, housing students who are either amped up on caffeine or are half asleep, having their first cup of coffee for the day; students who are buckling down on work or who are grabbing a cup of coffee with a friend or even on a date. The Starbucks inside the James Branch Cabell Library at Virginia Commonwealth University is one of the most bustling places for food/drink on campus, the line always fluctuating between a five minute wait for your drink to a 45 minute wait, the longest waits being in the morning between classes. During the day, the Starbucks is flooded with sunlight from the large bay windows that line the back wall that forms a sort of barrier between the outside world and the inside of the space. Once the sun sets, however, there are warm, soft lights that illuminate the space and give attention to the white, brown and black color palette of the room shown through the furniture and decor and that give the space a homey feel. I arrive at the library around 6PM on that Monday, and due to the short days of mid season winter, the sun had already set and a cold, dark blanket that is a February night engulfs VCU’s campus. My original intent when arriving to the library was to observe the surrounding area in a self-removed way, I wanted to see how the space functioned without my affect on it. Upon entering the Starbucks, I notice that the line is considerably short, so I take advantage of this and decide to hop in line and order myself a drink. I then begin to wander around to find a good place to set up to start doing my work and it comes to my attention that even though the Starbucks line is short, the surrounding table space is buzzing with students who are eating, studying, and enjoying the company of others. My friend Alyssa, a fellow peer in my Focused Inquiry class, waves me down and asks me to join her and her friend while they work on some homework. I happily oblige, as sitting with a friend is better than aimlessly wandering around looking for a seat for 20 more minutes. Throughout my time observing and sitting with Alyssa I am introduced to numerous amounts of her Intervarsity Soccer friends and realize that my original intent of how I would be observing has been changed unbeknownst to me. Towards the end of my time at the library and on my last Observation Log, I note “I’m very tired and overwhelmed from talking to various new people,” (9:05PM). In the end, I think that it says a lot about the space on how my intentions became skewed. Upon arrival to the library, I wanted to see how the space was self sufficient and functioned without me as a study space, but it was interesting to see how the space would not have functioned as a space for socialization without me being apart of the function whole. Posted 1 month ago by heere.